Building a house can be one of the most satisfying--or aggravating—experiences of a lifetime. The difference between building a dream house and a "nightmare on Elm Street" is often determined by your choice of builder. Best Built has the expertise and resources to make the process simple and your dream home a reality. The first thing you should do is get clear about your building needs and goals. How much space do you need? How much can you spend on the whole project – the land purchase and construction related costs? How will you finance it? Where will it be located? Do you plan to do some of the work yourself? Don't worry if you don't have all the answers. Best Built can help you clarify your goals and find answers that lead to a successful home building experience. When it comes to any real estate purchase, the buzzword is location. Finding the right location can be a time consuming process, but Best Built has the resources to assist you. We can help you find the right piece of property or we will work with your real estate agent to ensure that the land you find matches your budget and expectations. Our reputation of excellence will also make it easier to find the right financing. Click the links below for some useful landfinding listings. If you know exactly what you want you may want to work with an architect. 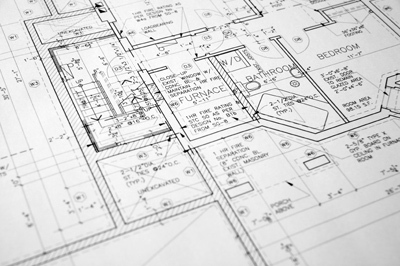 An architect will generally listen to your needs, consider your budget, and design a house to your specifications. You will want to work with an architect who is a member of The American Institute of Architects (AIA), which means that they subscribe to a professional code of ethics. Remember, you will be working with the architect for a long time. You want someone with whom you feel comfortable. Get recommendations from friends, relatives, or acquaintances who have worked with architects. Successful house-building projects are created when the client, architect and builder work together as a team. Best Built has excellent working relationships with area architects. When your specifications are more flexible, you can buy a house plan directly from Best Built or even on the internet. A house plan generally includes: an architectural rendering of the house, a set of floor plans, a foundation plan, an electrical plan that will show the locations of lights, receptacles, switches, etc., a roof drainage plan which will show the layout of all roof sections/planes, exterior elevations of all applicable front, sides and rear elevations, as well as any special exterior details, and interior elevations, including cabinets, cabinet details, columns and walls with unique conditions and a materials list. 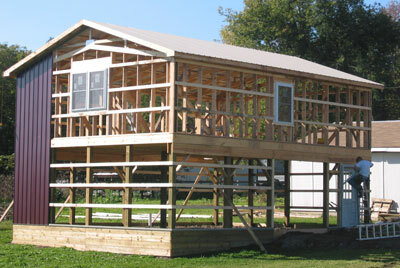 You can rest assured that the plan you purchase from Best Built meets all local building codes. Now is the time to consider green-building options. It starts with planning the best location on the property to maximize the use of sunlight and shade. Consider how the building’s exposure to the environment and facing can improve or hinder heating and cooling efficiency. Decide whether you want a geothermal system that requires excavation, and choose what other options may force changes in your site plan. Depending upon how much work was done on your site prior to purchase, site preparation can include building an access road to the property, connecting the site to the electrical grid, clearing the building site of any trees, rocks and debris, leveling the site, if necessary, and digging for the foundation being built. This is also the time when drilling for your well and your septic system installation will occur. In rural areas where houses are spaced too far apart for a sewer system to be efficient, people install a private sewage treatment plant, or septic system. A septic tank is simply a big concrete or steel tank that is buried in the yard. The tank might hold 1,000 gallons of water. Wastewater flows into the tank at one end displacing the water that's already there. This water flows out of the septic tank and into a drain field. A drain field is made of perforated pipes buried in trenches filled with gravel. Have you heard the expression, "The grass is always greener over the septic tank"? Actually, it is over the drain field that the grass takes advantage of the moisture and nutrients to grow lush and green. 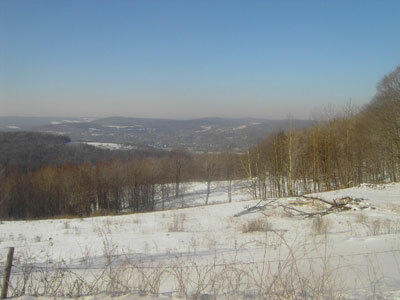 Much of central New York falls within the watershed system that supplies water to New York City. If your property is located within the watershed, there are special rules and regulations covering your septic system. Best Built understands these regulations and will ensure that your system is fully compliant with these mandates. Building a home is a process that works from the ground up and starts with a solid foundation. 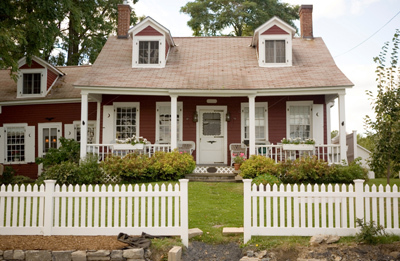 Houses are generally built on a foundation that is a basement, a crawl space or a slab. Best Built lays foundations that will stand the test of time. The slab is the simplest foundation to build. It is a flat concrete pad poured directly on the ground. It takes very little site preparation, very little formwork for the concrete and very little labor to create. It works well on level sites although slabs can be problematic in our northern clime where the ground freezes in the winter. This freezing can shift the slab at worst and at best lead to cold floors in the winter. Slabs are often used locally as the foundation for pole barns and garages. A house with a basement starts with a hole about 8 feet deep. At the bottom of the hole is a concrete slab, concrete or cinder-block walls form the outer walls of the basement. A basement is usually poured in three stages: the "Footers", then the walls and then the slab inside the walls. This approach helps keep the basement waterproof. Basement walls are insulated with rigid foam board and heavily waterproofed before dirt is backfilled against the walls. One foundation system we offer is linked below. Our system uses insulated concrete forms that provide better insulation in a basement, with an R-value of at least 20 – and perhaps more. That means a more comfortable, more efficent basement all year. A crawl space has some advantages over basements and slabs: it gets the house up off the ground, it is a lot less expensive than a basement and about 25% more then the cost of a slab. Ductwork and plumbing can run in the crawl space so they are easy to service and move over the lifetime of the house. In most cases, a crawl space is built with 4' solid block or poured walls. Concrete takes approximately four weeks to cure to full strength (depending on the weather), so once the concrete is poured nothing will happen for some period of time while the initial curing takes place. Once the foundation has set, construction can begin. Best Built Construction also recommends radiant heat be installed with our foundations, for more info click here. Framing is the first step in actually constructing the house and starts with building the floor (unless the house uses a slab foundation, in which case the slab is the floor). The floor starts with a sill-plate made of pressure-treated lumber in direct contact with the bricks of the crawl space or basement wall. Then the floor is constructed on the sill with joists, or 2x10 lumber. Once the floor framing is complete, it is covered with plywood and the sub-floor is finished. The crew then starts on the walls. Walls are assembled on the floor and raised into place. In the corners, the top plate on one wall overlaps the top plate of the next, and the walls are nailed together to bind the corners. Special framing, or headers, are installed to provide additional strength over the opening for windows and doors and to accommodate internal walls once they are built. All of the exterior walls go up following this same basic pattern. Interior walls are raised, fitting into the top plates of the exterior walls. Plywood is used to sheathe the outer walls providing rigidity and strength. The plywood will be cut out of the window openings as construction proceeds. Roof framing is a fairly complicated process; you can trust the traditional training and expertise of Best Built to do it right. Once the roof framing is up, the roof is covered in plywood, which gives the roof tremendous rigidity. The roof is subsequently covered with building paper (tar paper). The roofing material of your choice then goes on very quickly. The area extending out from the house under the roof is known as the soffit (parallel to the roof). The fascia boards run perpendicular to the roof; all exposed fascia wood is capped with a sheet of painted aluminum, or flashing, that is bent into shape on the site. The soffit is perforated so that air can flow into the attic and up through the ridge vents to ventilate the attic. Need your roof replaced? Whether you need a steel or shingle roof, Best Built uses the best quality products and promises a timely installation. And don’t forget to ask us about possible tax rebates. We stand behind every roofing job so that you never need worry about another leak. 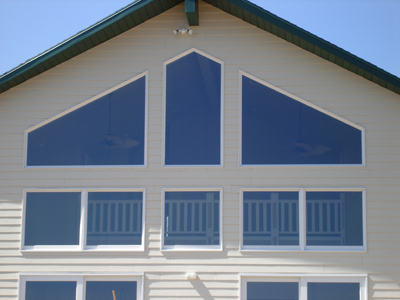 The next step in enclosure is windows and doors – for which we use Energy Star-rated products. The first step is to cut window openings from the plywood sheathing. Windows are placed in each rough opening, leveled, secured in place and sealed from the outside. Doors are installed following a similar process. Best Built has the expertise to apply whatever form of exterior covering you want for your home at very reasonable rates. Best Built can also handle stone and stucco work. Some great siding options are linked below. At this point, the house is "dried in," meaning that it is completely protected from rain. Now interior work can begin. Uniform construction codes ensure the installation of extremely reliable and safe plumbing and electrical systems. With Best Built you never have to worry whether your system is up to code; we guarantee that all our work meets or exceeds these standards. Rough plumbing involves the installation all of the water lines, sewer lines and bathtubs. Tubs are normally installed early because a full tub is heavy. The tub is installed and filled so that the frame can settle quickly. This step prevents cracked walls and tile the first time someone uses the tub. Typically, rough plumbing involves installing all sewer lines and vents as well as all water supply lines for each fixture. The purpose of the electrical system in a house is to distribute the power safely to all of the different rooms and appliances. Generally, the electrician places all of the boxes for electrical outlets, lights and switches, runs wires from the panel box to each of these boxes and clips and caps the wires prior to the installation of insulation and wallboard. The purpose of insulation is to lower the heating and cooling costs for the house by limiting heat transfer through the walls and the ceiling. Best Built use high quality styrofoam insulation throughout your home. The insulation process starts by installing foam channels in the eaves, which ensures that air will be able to flow from the soffit vents to the ridge vents. Without these channels, insulation tends to expand into the eaves and block the soffit vents. We install a vapor barrier to keep moisture that develops inside the house inside and insulation between rooms to enhance your needs for privacy. On the outside, the house now looks complete; but inside, it won't look "like a house" until the drywall goes up. Drywall (also known as "plaster board" and by the trade name "Sheetrock") is a half-inch layer of plaster or gypsum sandwiched between two thick sheets of paper. It is remarkably solid, and also remarkably heavy, a 4x12 sheet of drywall weighs about 100 pounds. The drywall is installed and taped fairly quickly. To "tape" the drywall means to cover all of the cracks and nails with drywall mud (spackling compound) so that the walls are completely smooth. The primary construction process is complete when the drywall goes up. With the primary construction complete, there is no longer the need for any heavy equipment to move around your property. Landscaping can now begin. Organizing and developing the site for maximum use and pleasure. Creating a visual relationship between the house and the site. Reducing landscape maintenance to a practical level. Growth and change separate landscape design from other arts. Most works of art such as architecture, sculpture and painting look their best when new. Landscape designs, however, are at their worst when new and improve with age. A well-designed landscape will seldom look the same any two months of the year. The key element in a good landscape design is planning. You may want to consult a professional landscape architect for your planning needs. The professionals at Best Built will work with you and your landscape architect to ensure that the landscape design you choose will enhance your home into the future. We have a reputation for excellence in the execution of the “hardscape” elements of landscaping – retaining and decorative walls, patios, pavement and sidewalks, driveways, etc. Putting down underlayment – The plywood put down during the initial framing is called subflooring. Generally it is covered with a vapor barrier and then 5/8-inch particle board or with rigid concrete wonder board for tile installations. Heating – Once the underlayment is down, the heating, air conditioning (when desired), vents and all duct work can be installed. If yours is a two-story home or a home built on a slab, some ductwork might have been installed in the walls or between floors prior to the hanging of the drywall. Finish electrical – The electrician returns to install all light fixtures, wall outlets, switches and cover plates. Kitchen and bathroom cabinets and counters – Best Built has extensive experience designing, making and installing custom cabinetry. You may also select manufacturer’s standard cabinets which we will expertly install. Depending upon your budget, Best Built will develop a cabinet plan that meets your needs. Finish plumbing - Once the cabinets are in, the plumber will install sinks, toilets and faucets. The plumber will also install the water heater, if it was not installed during rough plumbing and hook-ups to your well and septic system. Wall trim – After the cabinets are installed, the interior doors and the molding around the doors, windows and baseboards go in. Floor Coverings - When the painting is finished, carpet, tile and/or the flooring of your choice go down. At this point, Best Built inspects the house and creates a “punch list” of any problems. 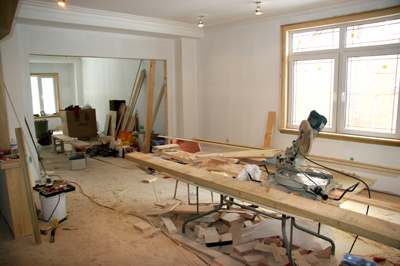 These minor repairs are quickly executed and when complete, the house is finished. Then we’ll check its efficiency for ourselves. We block all the openings and perform a blower test to see that the house is airtight. Energy Star standards aren’t good enough for us; we typically exceed Energy Star compliance by 75 percent. Once the house is inspected by the local code enforcement officer and a certificate of occupancy is issued, it's time for you to move in to your dream home! info@bestbuiltconstruction.com - Serving Central New York - All Estimates are absolutely FREE!